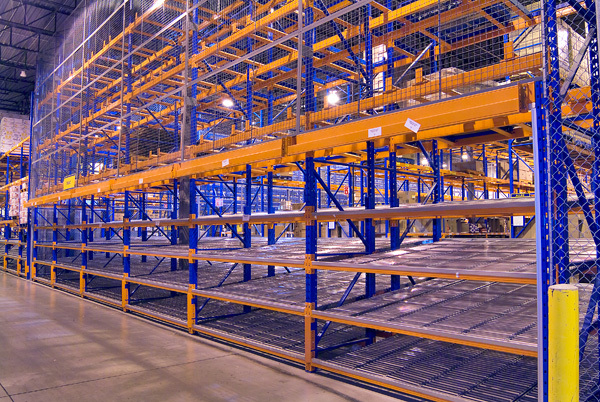 Carton flow rack is a storage system where cartons are fed from one side of an aisle, and retrieved from the other. This system uses roller bed shelves. The rails are built on a slight incline, higher on the side that is fed, so that the cartons move forward when they are loaded into the system. These multiple tier roller decks are mounted within a first level rack bay and are used to present an increased number of SKU’s or products to the picker. There are a wide array of decks to choose from on the market, each with a particular roller configuration, each built for differing capacity, size of carton, and budget. sensitive to First In First Out rotation.